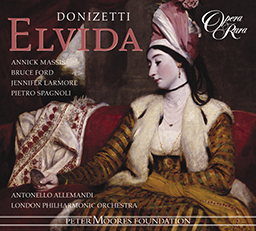 With an all-star cast under the expert direction of David Parry, this studio recording is an essential purchase for all opera lovers. With an all-star cast under the expert direction of David Parry, this studio recording is an essential purchase for all opera lovers. 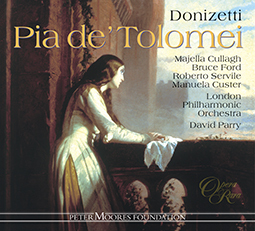 Composed for Venice in 1836, Pia de’ Tolomei should have had its first performance at the Teatro la Fenice but the famous theatre was destroyed by fire before the end of the year. Eventually the opera was given at the Teatro Apollo on 18 February 1837. The plot rises to the same melodramatic heights as Donizetti’s well-known Lucia di Lammermoor. The composer, as we have seen many times before, ensures that his heroines suffer to the most sublime music. And, like Lucia, Pia is a woman caught in circumstances that eventually bring her story to a tragic end. Or do they? 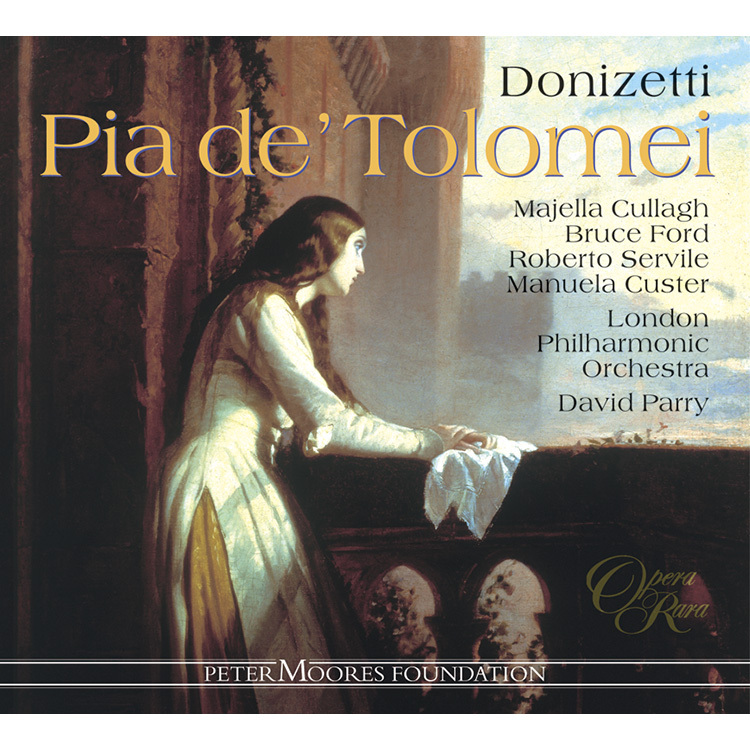 When Pia de’ Tolomei was given in Naples the strict rules of censorship forced Donizetti to revise the ending – death was not allowed on the stage. In their customary fashion Opera Rara gives you the opportunity to hear both endings. 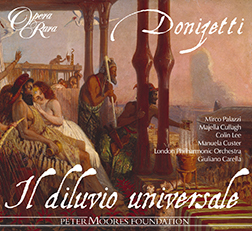 In fact, all of the music Donizetti wrote for subsequent productions is included in this comprehensive recording. 04 Pia de’ Tolomei: Part I scena III: Cavatina: Non puo dirti la parola – scena IV: Ebben? 05 Pia de’ Tolomei: Part I scena IV: Cavaletta: Mi volesti sventurato? – scena V: Surce la Pia? 09 Pia de’ Tolomei: Part I scena VII: scena: Pia? Lamberto? 11 Pia de’ Tolomei: Part I scena VIII: scena: Giurai svenarlo – scena IX: Nello? 17 Pia de’ Tolomei: Part I scena XII: Dell’inatteso tuo venir la nouva – scena XIII: Pia? Signor? 19 Pia de’ Tolomei: Part I scena XIV: scena: Ah! signora? – scena XV: Pia? 21 Pia de’ Tolomei: Part I scena XVI: scena: L’uscio dischiudi – scena XVII: Ch’io sveni entrambi? – scena XVIII: Fuggi quel vil!? 22 Pia de’ Tolomei: Part I scena XVIII: Stretta: Ah! quell’ira bollente per poco raffrena? 24 Pia de’ Tolomei: Part II scena I: Ahi! si barbara minaccia – scena II: Signor ? 25 Pia de’ Tolomei: Part II scena II: Cabaletta: A me stesso un Dio mi rende? 26 Pia de’ Tolomei: Part II scena III: Tu Ghino alle Maremme! – scena IV: Chi veggio! 33 Pia de’ Tolomei: Part II scena VII: Aria: Lei perduta, in core ascondo Velenoso un dardo acuto? 34 Pia de’ Tolomei: Part II scena VII: scena: Fragor di spade! – scena VIII: Oh, ciel! 37 Pia de’ Tolomei: Part II scena IX: scena: Eterno Dio! Respiro? 38 Pia de’ Tolomei: Part II scena IX: Aria: Sposo, ah! tronca ogni dimora? – scena X: Pia? 39 Pia de’ Tolomei: Part II Cabaletta: Ah! Di Pia? che muore? e geme? 40 Pia de’ Tolomei: Part I scena XII: Dell’inatteso tuo venir la nouva – scena XIII: Pia? Signor? 42 Pia de’ Tolomei: Part I scena XIV: scena: Ah! signora? – scena XV: Pia? 44 Pia de’ Tolomei: Part I scena XVI: scena: L’uscio dischiudi – scena XVII: Ch’io sveni entrambi? – scena XVIII: Fuggi quel vil!? 46 Pia de’ Tolomei: Part II scena X: scena: Di Ghino il cenno udiste? 47 Pia de’ Tolomei: Part II scena XI: scena: Tutto e silenzio! – scena XII: Ah, signora? – scena XIII: Pia? 49 Pia de’ Tolomei: Part II scena XIV: scena: L’uscio dischiudi, o perfida! – scena XV: Ch’io sveni – scena XVI: Fuggi quel vil!? 50 Pia de’ Tolomei: Part II scena XVI: Quartet: Ah! come congiungere il cielo potea – scena XVII: Quel codardo ne deluse!? 54 Pia de’ Tolomei: Part I scena XIV: L’uscio dischiudi – scena XV: Ch’io sveni entrambi? – scena XVI: Fuggi quel vil!? 58 Pia de’ Tolomei: Part III scena I: Eterno Dio! Respiro? 59 Pia de’ Tolomei: Part III scena I: Aria: Sposo, ah! tronca ogni dimora? – scena II: Sposa mia! Scene 1. It is the year 1260, during the struggles between Guelf Florence and Ghibelline Siena. We are in a castle belonging to the Tolomei family, well outside Siena, where the Ghibelline Nello della Pietra has sent his Guelf-born wife Pia de’ Tolomei for her safety. Members of the household are curious, since a messenger has arrived in the early hours before the dawn. They imagine he has come from the Ghibelline camp, bringing news from Nello for Pia, but Ubaldo, Nello’s servant, informs them that the stranger’s arrival must be kept secret even from their mistress – his presence may be revealed only to Ghino degli Armieri, Nello’s cousin. In fact the messenger has brought an intercepted letter, in which an unidentified correspondent informs Pia that in ‘the absence of your hated husband’ he will join her and embrace her this coming night. Ghino, who is himself guilty of trying to seduce her, but who has been sternly rejected, understandably leaps to the conclusion that she is about to receive a visit from a secret lover. His jealousy and resentment are aggravated when Bice, Pia’s waiting woman, informs him that her mistress refuses to see him. His illicit passion rapidly turns into a desire for revenge, and, with the intention that the rendez-vous should go ahead and that Pia should be surprised in flagrante, he orders Ubaldo to allow the letter to be delivered. He declares his intention of returning to the camp to inform Nello of the shame that he believes Pia has brought upon him. Scene 2. Pia’s handmaidens are enjoying the freshness of the dawn, but Pia herself is despondent and anxious: she knows that a battle threatens between the Florentines and the Sienese, and she is torn in her allegiances since her husband fights for Siena and her brother Rodrigo for Florence. Her elderly retainer Lamberto brings her a letter – the same letter we have already encountered in the first scene – handed to him by an unknown man in the park. As she opens it she is overcome with relief and joy, for, although she does not yet reveal the fact, it comes from Rodrigo. Scene 3. In the Ghibelline camp Nello ruminates on the fate that he believes hangs over Rodrigo. Captured by the Sienese, he is due to be executed the following morning. These thoughts are interrupted by Ghino, who comes to report Pia’s supposed infidelity. Outraged, Nello determines upon revenge, while Ghino, all too conscious of his own dishonourable motives and actions, realises that he has ventured too far to entertain any thought of repentance and retraction of his accusations. Scene 4. Rodrigo, confined in a dungeon, laments the dangers to which Pia would be exposed if he were to be executed. One of his gaolers, who has in fact been bribed by Pia, brings him word that when the guard is next changed, he will be given an opportunity to escape. At the appropriate moment he is presented with helmet, sword and mantle, and is duly led to freedom. Scene 5. Nello and Ghino arrive at the Tolomei castle, and are admitted to Pia’s apartments. Ghino orders their followers to conceal themselves in the park: they are to allow a stranger to enter the castle unimpeded, but are to prevent all attempt at egress. There is a constrained meeting between Nello and Pia, the former secretly seething because he believes his wife faithless, the latter alarmed since she is awaiting the arrival of Rodrigo. Nello and Ghino tell her that they are paying only the most cursory visit, and pretend to take their leave. No sooner have they withdrawn than Rodrigo appears. Pia is terrified lest he be discovered, but Lamberto reveals the existence of a secret passageway that will allow him to escape from the castle. As Nello and Ghino return to break down the now-locked door, Rodrigo is whisked away, Pia helping to conceal his flight by overturning the only lit candle in the apartment. Nello reviles her and threatens her with bloody punishment. Scene 1. Lamberto comes to the Florentine camp to tell Rodrigo that Nello has incarcerated Pia in a castle in the stagnant marshlands of the Maremma, with the intention that she should succumb to malarial fevers. They are surprised by alarums. The encampment is being assailed by the Ghibellines, and Rodrigo races to battle, with the determination of then proceeding to Pia’s rescue. Scene 2. Ghino arrives at the castle in the Maremma. He still lusts after Pia, and still hopes to save her if only she will yield to his advances. But she again rejects him, and when she reveals that her nocturnal visitor was no lover but in fact her brother, he is horrified to realise the monstrosity of his misconstruction of events. Veering from one extreme attitude to another, he determines to inform Nello of the truth and then to commit suicide. Pia urges him to live and repent. Ubaldo, after Ghino’s departure, receives a letter from Nello, ordering him – unless this command is revoked before dawn – to put Pia to death. Scene 3. A hermitage where Piero, the chief solitary, and his companions are witnesses of a tremendous storm. As winds and rain reach their height, Nello and his followers come seeking shelter. Piero, who has heard of the vengeance that Nello is wreaking upon Pia, assures him of his wife’s innocence, but Nello, convinced of her guilt, remains unmoved. A clash of swords is heard. Ghino has been set upon by a band of Guelfs, and enters mortally wounded. He asserts Pia’s innocence – reveals that her nocturnal visitor was her brother – and confesses his own illicit love for her. Nello is with difficulty restrained from killing him, but the hand of death is in any case upon him. He dies, begging for – but not granted – forgiveness. Nello is seized with alarm and dismay as he realises how slender are his chances of reaching the castle in the Maremma before the coming of the dawn. Scene 4. Pia’s prison, where Ubaldo prepares a cup of poison in anticipation of the dawn. Pia is already burning with fever, and awakes terrified from a nightmare in which she imagined she saw Nello slain by Rodrigo. Seeking to assuage her fever she drinks from the poisoned cup. She hopes that Ghino may by now have told Nello of her innocence, and that Nello will hasten to rescue her from the death that inevitably faces her if she remains here amid the infected Maremma airs. Nello arrives. He is relieved to find Pia still alive, but as she begins to falter the truth becomes only too apparent. Rodrigo and his Guelf followers also burst in, and Rodrigo is all for slaying Nello when he hears that Pia is poisoned. Pia, however, justifies her husband, explaining that he was deceived by appearances. She succeeds in reconciling husband and brother before she dies. 1. Szene. Es ist das Jahr 1260. Zwischen den Guelfen von Florenz und den Ghibellinen von Siena kommt es immer wieder zu erbitterten Kämpfen. Wir sind in einer Burg weit außerhalb Sienas, die sich im Besitz der Familie Tolomei befindet und in die sich die Guelfin Pia de’ Tolomei auf Geheiß ihres Mannes, des ghibellininischen Nello della Pietra, zu ihrer Sicherheit zurückgezogen hat. Die Bediensteten sind neugierig, denn im Morgengrauen ist ein Bote eingetroffen. Sie vermuten, dass er aus dem Lager der Ghibellinen kommt und eine Nachricht von Nello an Pia übermittelt. Ubaldo, Nellos Diener, erklärt ihnen jedoch, dass sie die Ankunft des Fremden vor ihrer Herrin geheim halten müssen – nur Nellos Cousin Ghino degli Armiere dürfe von seiner Anwesenheit wissen. In Wahrheit überbringt der Bote einen Brief, der abgefangen wurde und in dem ein anonymer Schreiber Pia mitteilt, dass er sie „in der Abwesenheit Eures verhassten Gemahls“ in der kommenden Nacht besuchen und in die Arme schließen werde. Ghino, der Pia selbst verführen möchte, aber streng von ihr zurückgewiesen wurde, glaubt natürlich, dass es sich bei dem Fremden um ihren Geliebten handelt. Seine Eifersucht und sein Zorn steigern sich noch, als Bice, Pias Zofe, ihm mitteilt, dass ihre Herrin ihn nicht empfangen will. Seine Leidenschaft schlägt rasch in Rachegedanken um. So beauftragt er Ubaldo, den Brief zustellen zu lassen, damit das nächtliche Stelldichein stattfinden und er Pia in flagranti ertappen kann. Dann erklärt Ghino, er werde ins Lager zurückkehren, um Nello von der angeblichen Untreue Pias zu berichten. 2. Szene. Pias Zofen erfreuen sich an der Morgenkühle, aber Pia selbst ist verzweifelt und voll Sorge: Sie weiß, dass eine Schlacht zwischen den Florentinern und den Sienesen bevorsteht und ist gespalten in ihrer Loyalität, da ihr Mann auf Seiten Sienas kämpft, ihr Bruder Rodrigo jedoch bei den Florentinern. Das Faktotum Lamberto überbringt ihr einen Brief – eben denjenigen, den wir bereits aus der ersten Szene kennen –, der ihm im Park von einem Unbekannten überreicht wurde. Als Pia ihn öffnet, ist sie überglücklich und erleichtert, denn der Brief stammt von Rodrigo, auch wenn sie das jetzt noch niemandem sagt. 3. Szene. Im Lager der Ghibellinen sinniert Nello über das Schicksal Rodrigos, der von den Sienesen gefangen genommen wurde und am folgenden Morgen hingerichtet werden soll. Seine Gedanken werden durch die Ankunft Ghinos unterbrochen, der ihm von Pias vermeintlicher Untreue berichtet. Wütend sinnt Nello auf Rache, während Ghino, der sich seiner ehrlosen Motive nur allzu bewusst ist, erkennt, dass er zu weit gegangen ist, um seine Anschuldigungen noch zurücknehmen zu können. 4. Szene. In seinem Kerker klagt Rodrigo über die Gefahren, die seine Hinrichtung für Pia bedeuten können. Einer seiner Bewacher, der von Pia bestochen wurde, teilt ihm mit, dass er bei der nächsten Wachablösung eine Gelegenheit zur Flucht erhalten wird. Im entsprechenden Moment werden ihm Helm, Schwert und Umhang gebracht, und er wird in die Freiheit geführt. 5. Szene. Nello und Ghino treffen in der Burg Tolomei ein und werden zu Pia vorgelassen. Ghino befiehlt den Gefolgsleuten, sich im Park zu verstecken. Sie sollen einen Fremden ungehindert die Burg betreten lassen, ihn jedoch am Fortgehen hindern. Die Begegnung zwischen Nello und Pia verläuft angespannt: Nello ist erzürnt, da er seine Frau insgeheim des Ehebruchs bezichtigt, Pia ist voll Sorge, da sie auf Rodrigo wartet. Nello und Ghino sagen, sie könnten ihr nur einen sehr kurzen Besuch abstatten, und geben vor, wieder ins Lager aufzubrechen. Kaum sind sie abgetreten, trifft Rodrigo ein. Pia hat große Angst, er könnte entdeckt werden, aber Lamberto zeigt ihm einen Geheimweg, über den er die Burg verlassen kann. Als Nello und Ghino zurückkehren, um die mittlerweile verschlossene Tür aufzubrechen, kann Rodrigo unerkannt fliehen, zumal Pia die einzige Kerze im Raum umstößt. Nello schmäht sie und droht ihr eine blutige Vergeltung an. 1. Szene. Lamberto kommt in das Lager der Florentiner, um Rodrigo mitzuteilen, dass Nello Pia in eine Burg im Sumpfland der Maremma verbannt hat, damit sie der Malaria erliege. Die Alarmglocken läuten. Das Lager wird von den Ghibellinen angegriffen, und Rodrigo zieht in die Schlacht, um anschließend zu Pias Rettung zu eilen. 2. Szene. Ghino trifft in der Burg in der Maremma ein. Er verlangt noch immer nach Pia und hofft, dass sie seinem Werben nachgeben wird, wenn er sie rettet. Doch sie weist ihn erneut zurück. Als sie ihm offenbart, dass ihr nächtlicher Besucher keineswegs ein Geliebter war, sondern ihr Bruder, ist er entsetzt, was er mit seiner ungeheuren Bezichtigung angerichtet hat. Plötzlich von Schuldgefühlen überwältigt, beschließt er, Nello die Wahrheit zu gestehen und dann Selbstmord zu begehen. Pia dringt in ihn, weiterzuleben und Reue zu üben. Nach Ghinos Abgang erhält Ubaldo einen Brief von Nello, in dem dieser ihm aufträgt, Pia zu töten, falls dieser Befehl nicht vor Morgengrauen widerrufen wird. 3. Szene. Eine Klause, in der der Einsiedler Piero und seine Gefährten ein heftiges Gewitter verfolgen. Im peitschenden Wind und Regen suchen Nello und seine Gefolgsleute Schutz in der Klause. Piero hat von der Rache erfahren, die Nello an seiner Frau übt, und beschwört ihn, dass sie unschuldig ist, doch Nello ist von ihrer Schuld überzeugt und lässt sich nicht umstimmen. Schwerterklirren ist zu hören. Dann kommt Ghino, tödlich verletzt von einer Schar Guelfen, in die Klause. Er beteuert Pias Unschuld, offenbart, dass ihr nächtlicher Besucher ihr Bruder war, und gesteht seine eigene Liebe zu ihr. Nur mit Mühe wird Nello daran gehindert, ihn zu töten, aber Ghino ist ohnehin dem Tod geweiht. Er fleht um Vergebung, die Nello ihm jedoch nicht gewährt. Mit Entsetzen wird Nello bewusst, dass es ihm kaum gelingen wird, die Burg in der Maremma vor Morgengrauen zu erreichen. 4. Szene. Pias Gefängnis, in dem Ubaldo in Erwartung des Morgengrauens einen Giftbecher vorbereitet. Pia brennt bereits vor Fieber und schreckt aus einem Alptraum hoch, in dem sie träumte, Nello sei von Rodrigo erschlagen worden. Um das Fieber zu lindern, trinkt sie von dem Giftbecher. Sie hofft, dass Ghino mittlerweile Nello von ihrer Unschuld überzeugt hat und ihr Mann zu ihr eilt, um sie vor dem Tod zu bewahren, der ihr in diesem verseuchten Sumpfgebiet sicher ist. Nello trifft ein. Er ist erleichtert, Pia noch am Leben zu finden, doch als ihre Kräfte zu schwinden beginnen, wird ihm bewusst, was vorgefallen ist. Da stürzen Rodrigo und seinen Guelfen-Gefolgsleute herein. Rodrigo ist nahe daran, Nello zu töten, als er erfährt, dass Pia vergiftet wurde. Doch Pia rechtfertigt das Verhalten ihres Mannes und erklärt, er habe sich von den Umständen täuschen lassen. Ehe sie stirbt, gelingt es ihr, ihren Mann und ihren Bruder zu versöhnen. Scena 1. È l’anno 1260, nel periodo delle lotte tra i Guelfi di Firenze e i Ghibellini di Siena. Nello della Pietra, ghibellino, ha inviato la moglie Pia de’ Tolomei in un castello di proprietà della famiglia di lei, per sicurezza. La servitù è curiosa: poco prima dell’alba è arrivato un messaggero. Si pensa che venga dall’accampamento ghibellino e che porti a Pia notizie di Nello, ma Ubaldo, servitore di Nello, comunica che l’arrivo dello straniero deve rimanere segreto anche alla padrona: la sua presenza potrà essere rivelata solo al cugino di Nello, Ghino degli Armieri. In realtà quella portata dal messaggero è una lettera intercettata: il suo non identificato autore comunica a Pia che, in assenza del suo “odiato marito”, verrà ad abbracciarla questa sera. Ghino, colpevole personalmente di un tentativo di seduzione della donna, che lo ha duramente respinto, conclude comprensibilmente che si tratti di un amante segreto. La sua gelosia e il suo risentimento vengono alimentati da Bice, dama di compagnia di Pia, la quale gli comunica che la padrona rifiuta di vederlo. La passione proibita si trasforma rapidamente in desiderio di vendetta. Con l’intenzione di fare svolgere l’appuntamento e sorprendere Pia in flagrante, Ghino ordina a Ubaldo di consegnare la lettera e dichiara la propria intenzione di ritornare all’accampamento per svelare a Nello l’onta perpetrata dalla moglie sul suo nome. Scena 2. Mentre le sue ancelle si godono il fresco dell’alba, Pia è triste e in preda all’ansia. Si profila uno scontro tra fiorentini e senesi e il suo animo è lacerato: suo marito combatte per Siena e suo fratello Rodrigo per Firenze. L’anziano servitore Lamberto le porta una lettera, la stessa della prima scena, che gli è stata consegnata da uno sconosciuto nel parco. La donna l’apre ed è sopraffatta dal sollievo e dalla gioia. Anche se non lo rivela, la lettera è di Rodrigo. Scena 3. L’accampamento dei Ghibellini. Nello rimugina sul destino che incombe sul cognato Rodrigo, catturato dai Senesi, la cui esecuzione è prevista per la mattina seguente. I suoi pensieri sono interrotti da Ghino, che viene a riferirgli la presunta infedeltà di Pia. Oltraggiato, Nello decide di vendicarsi, mentre Ghino, anche troppo consapevole della colpevolezza delle proprie motivazioni, si rende conto di essersi spinto troppo oltre per pentirsi e ritirare le accuse. Scena 4. Confinato in un sotterraneo, Rodrigo teme i pericoli che la propria esecuzione provocherebbe per la sorella. Uno dei carcerieri, in realtà corrotto da Pia, gli comunica che avrà la possibilità di fuggire al successivo cambio della guardia. Al momento giusto gli vengono consegnati un elmo, una spada e un mantello e l’uomo viene scortato verso la libertà. Scena 5. Nello e Ghino arrivano al castello dei Tolomei e sono ricevuti negli appartamenti di Pia. Ghino ordina al proprio seguito di nascondersi nel parco: un estraneo entrerà nel castello e non deve essere ostacolato, ma è necessario impedirgli assolutamente di uscirne. L’incontro tra Nello e Pia è innaturale: l’uomo freme segretamente di rabbia al pensiero dell’infedeltà della moglie, la donna è sulle spine perché attende l’arrivo di Rodrigo. Nello e Ghino dichiarano che la loro sarà una visita brevissima e fingono di accomiatarsi. Appena escono, compare Rodrigo. Pia è terrorizzata e teme che possa essere scoperto, ma Lamberto rivela l’esistenza di un passaggio segreto che gli consentirà di fuggire dal castello. Mentre Nello e Ghino ritornano per abbattere la porta ormai chiusa a chiave, Rodrigo viene allontanato e Pia favorisce la sua fuga rovesciando l’unica candela accesa nell’appartamento. Nello la insulta e minaccia una cruenta punizione. Scena 1. Lamberto arriva nell’accampamento fiorentino per comunicare a Rodrigo che Nello ha rinchiuso Pia in un castello tra le paludi della Maremma toscana, per farla morire di malaria. I due vengono sorpresi dal rumore di uno scontro. L’accampamento è attaccato dai Ghibellini e Rodrigo si precipita a combattere, deciso a liberare successivamente Pia. Scena 2. Ghino arriva al castello in Maremma. È ancora in preda alla passione per Pia e spera di salvarla, a condizione che ceda alle sue lusinghe. Ma lei lo respinge ancora una volta e rivela che il suo visitatore notturno non era un amante, ma il fratello. L’uomo inorridisce rendendosi conto della mostruosità del proprio errore. Passando da un estremo all’altro, decide di comunicare a Nello la verità e poi suicidarsi. Pia lo sollecita a vivere e pentirsi. Dopo la partenza di Ghino, Ubaldo riceve una lettera da Nello che gli ordina di uccidere Pia, a meno che il comando non venga revocato prima dell’alba. Scena 3. Un eremo. Piero, il capo eremita, e i suoi compagni, assistono a una spaventosa tempesta. Mentre la forza degli elementi raggiunge il culmine, arriva Nello con il suo seguito, in cerca di riparo. Piero, che è a conoscenza della vendetta di Nello contro Pia, gli assicura che la moglie è innocente ma Nello, convinto della sua colpevolezza, rimane irremovibile. Si sente un cozzare d’armi: Ghino è stato sorpreso da una banda di Guelfi ed entra, ferito a morte. Dichiara l’innocenza di Pia, rivela che il suo visitatore notturno era il fratello e confessa il proprio amore colpevole per lei. Nello vorrebbe ucciderlo e viene trattenuto a forza, ma è comunque troppo tardi. Ghino muore, chiedendo invano perdono. Nello viene preso dalla preoccupazione e dallo sgomento: si rende conto che ha poche possibilità di raggiungere il castello nella Maremma prima dell’alba. Scena 4. La prigione di Pia, prima dell’alba. Ubaldo prepara un calice di veleno. Pia brucia già di febbre e si sveglia, terrorizzata: in un incubo ha visto Rodrigo uccidere Nello. Nel tentativo di calmare la febbre, beve dal calice avvelenato. Si augura che ormai Ghino abbia rivelato a Nello la sua innocenza e che il marito si affretti a salvarla dalla morte ormai inevitabile tra le esalazioni mefitiche della Maremma. Arriva Nello. È sollevato nel trovare Pia ancora viva, ma la donna inizia a vacillare e la verità si rivela anche troppo presto. Irrompono anche Rodrigo e il suo seguito di Guelfi e Rodrigo è pronto a uccidere Nello quando viene a sapere che Pia è stata avvelenata. La donna però giustifica il marito, spiegando che è stato tratto in inganno dalle apparenze. Riesce a riconciliare marito e fratello prima di spirare. Scène 1. L’action se déroule en 1260, lors des affrontements entre les guelfes de Florence et les gibelins de Sienne, au château des Tolomei qui est situé en dehors de la ville de Sienne. Le gibelin Nello della Pietra y a envoyé son épouse Pia de’ Tolomei, une guelfe, pour qu’elle y soit en sécurité. L’arrivée avant l’aube d’un messager excite la curiosité de tous : peut-être vient-il du camp gibelin pour apporter des nouvelles de Nello à Pia. Ubaldo, le serviteur de Nello, déclare pourtant que l’arrivée de l’étranger ne doit être révélée à personne, pas même à la maîtresse des lieux – seul Ghino degli Armieri, le cousin de Nello, peut en être averti. En fait, le messager est porteur d’une lettre qui a été interceptée et dans laquelle un correspondant anonyme informe Pia qu’en « l’absence de [son] époux détesté », il viendra la voir et l’embrasser le soir même. Ghino, qui lui-même a tenté de séduire la jeune femme et essuyé un ferme refus, en conclut naturellement qu’elle s’apprête à recevoir la visite d’un amant secret. Sa jalousie et son ressentiment sont à leur comble lorsque Bice, la servante de Pia, lui annonce que sa maîtresse refuse de le recevoir. Sa passion illicite se transforme vite en désir de vengeance. Aussi ordonne-t-il à Ubaldo de remettre le message à sa destinataire afin que le rendez-vous ait lieu et que Pia soit surprise en flagrant délit. Il déclare son intention de retourner au camp pour informer Nello de la honte que Pia fait peser sur lui. Scène 2. Tandis que ses servantes se réjouissent de la fraîcheur de l’aube, Pia elle-même est abattue, inquiète : elle sait qu’une bataille risque d’éclater entre les Florentins et les Siennois, et elle a le cœur déchiré entre, d’un côté, son époux qui combat pour Sienne et, de l’autre, son frère Rodrigo qui soutient Florence. Lamberto, le vieux serviteur de Pia, lui apporte une lettre – celle-là même dont il a été question à la scène précédente –, que lui a remise un inconnu dans le parc du château. À sa lecture, elle est submergée par un sentiment de soulagement et de joie, car, même si elle ne dit rien de l’identité de son auteur, il s’agit de Rodrigo. Scène 3. Dans le camp des gibelins, Nello médite sur le sort qui attend Rodrigo. Capturé par les Siennois, celui-ci doit être exécuté le lendemain matin. Il est interrompu dans ses pensées par Ghino, venu lui révéler la prétendue infidélité de Pia. Outragé, Nello décide de se venger tandis que Ghino, fort conscient de l’ignominie des motifs qui l’ont poussé à agir, comprend qu’il est trop tard pour se repentir et retirer ses accusations. Scène 4. Rodrigo, enfermé dans un donjon, se lamente à l’idée des dangers auxquels Pia sera exposée s’il est exécuté. L’un de ses geôliers, que Pia a acheté, vient l’avertir qu’à la prochaine relève de la garde, il aura l’occasion de s’enfuir. Au moment venu, on lui remet un heaume, une épée et un manteau, et on lui rend, comme prévu, la liberté. Scène 5. Nello et Ghino arrivent au château des Tolomei et sont reçus dans les appartements de Pia. Ghino ordonne à leurs hommes de se cacher dans le parc : ils devront laisser l’étranger pénétrer librement dans le château, mais l’empêcher à tout prix d’en sortir. La rencontre entre Nello, furieux à l’idée de l’infidélité de sa femme, et Pia, inquiète à la perspective de l’arrivée de Rodrigo, est tendue. Nello et Ghino prétendent ne pas pouvoir s’attarder et se retirent. Aussitôt qu’ils ont disparu, Rodrigo fait son entrée. Pia a terriblement peur que sa présence soit découverte, mais Lamberto révèle l’existence d’un passage secret qui permettra à Rodrigo de quitter le château. Au moment où Nello et Ghino reviennent pour forcer la porte maintenant verrouillée, Rodrigo prend la fuite et Pia couvre celle-ci en renversant le seul flambeau allumé dans la pièce. Nello se répand en injures et menace de se venger dans le sang. Scène 1. Lamberto rejoint le camp des Florentins pour prévenir Rodrigo que Nello a emprisonné Pia dans un château au milieu des marais insalubres de la Maremma, avec l’espoir qu’elle succombera au paludisme. Ils sont surpris par l’alerte d’une attaque contre le camp par les gibelins. Rodrigo court au combat avec la ferme intention de se porter ensuite au secours de Pia. Scène 2. Ghino arrive au château de la Maremma. Il convoite toujours les faveurs de Pia et compte la sauver si elle cède à ses avances. Mais elle les rejette, et lorsqu’elle lui révèle que son visiteur nocturne n’était nul autre que son frère, il mesure avec horreur la monstruosité de son interprétation des événements. Passant d’une extrême attitude à l’autre, il décide d’apprendre la vérité à Nello pour ensuite se suicider. Pia lui enjoint de vivre et de se repentir. Après le départ de Ghino, Ubaldo reçoit un message de Nello lui ordonnant – à moins d’un ordre contraire avant l’aube – d’assassiner Pia. Scène 3. Un ermitage. Piero, le père supérieur, assiste avec les autres religieux à une terrible tempête. Alors que les vents et la pluie se déchaînent, Nello et ses hommes viennent chercher refuge auprès d’eux. Piero, qui a entendu parler du châtiment que Nello a infligé à Pia, l’assure de l’innocence de celle-ci, mais, convaincu de sa culpabilité, Nello reste intraitable. Un bruit d’épée se fait alors entendre. Ghino, victime d’une embuscade guelfe, entre sur scène, mortellement blessé. Il révèle à Nello l’identité du visiteur nocturne de Pia en insistant sur son innocence et en lui avouant sa passion illicite pour elle. Nello veut tuer son cousin et c’est avec difficulté qu’on l’en empêche ; de toutes façons, l’ombre de la mort plane déjà sur lui. Il meurt en suppliant – en vain – son cousin de le pardonner. Nello s’alarme et s’épouvante, conscient du peu de temps qu’il lui reste pour atteindre le château de la Maremma avant le point du jour. Scène 4. La prison de Pia, où Ubaldo prépare une coupe de poison en prévision du lendemain matin. Pia, qui brûle déjà de fièvre, se réveille en sursaut après avoir vu en cauchemar Rodrigo assassiner Nello. Pour lutter contre la fièvre, elle se désaltère en buvant la coupe empoisonnée. Elle a l’espoir que Nello a appris son innocence de la bouche de Ghino, et qu’il va vite venir la soustraire au trépas qui la menace si elle est exposée plus longtemps aux miasmes de la Maremma. Nello arrive. Il est soulagé de trouver Pia encore vivante, mais lorsque les forces de la jeune femme commencent à l’abandonner, la vérité se fait jour. Rodrigo et ses compagnons guelfes font irruption au château, et Rodrigo est prêt à tuer Nello lorsqu’il apprend l’empoisonnement de sa sœur. Pia prend toutefois la défense de son époux en expliquant qu’il a été trompé par les apparences. Elle parvient à réconcilier son époux et son frère avant de mourir.